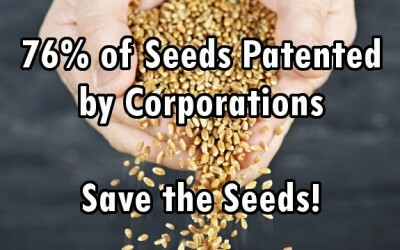 76% of Seeds Patented by Corporations: Save the Seeds! 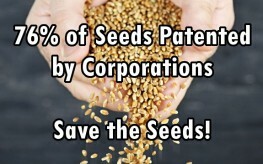 76% of Seed Market is Patented by Corporations: Save the Seeds! Over 90% of the crop varieties grown a century ago are no longer used in this country; many aren’t even maintained in seed storage facilities. In addition to that, just 6 companies in the world have patented most of the seeds grown in the entire global agricultural market. Our food diversity is crumbling and it’s largely because corporations, not people, are in charge of the supply. But saving seeds in your vegetable garden or on your small family farm could potentially sustain the current diversity and slow or even reverse the degradation of our food supply. Natural Society’s own Christina Sarich recently reported for Nation of Change how corporations own the seeds. These companies, like Monsanto, Dupont, Dow, and Bayer, have helped to whittle away at the heritage of global food, all in an effort to maximize profits. (Also, here are the top 10 companies ruining the natural world with pesticides – companies which also own the seeds). By making their seeds resistant to chemical pesticide and herbicide applications, the corporations have made their seeds patentable. They are essentially patenting life—it’s life with often genetically-modified components, too! The problem with this idea is that it’s wreaking havoc on global agriculture, despite promises to the contrary. These crops are failing, farmers are suffering in debt, and the giant seed companies are laughing all the way to the bank. Prior to this big business takeover of farming, people worked the land, saving seeds from year to year. They carried varieties from their ancestors into modern times through these seed saving practices. For many, the practice is alive and well. For others, it needs to be rekindled. What does all of this mean for you, the backyard gardener? While the massive corporations who control global food supplies may seem out of your reach, you can start seed-saving today. If you garden, save the seeds from this year’s harvest for next year’s plants. Share with fellow organic gardeners and help work to rebuild a diverse system from the ground up. Here are 5 foods you can grow from organic, store-bought produce. This is why it is so important to go to Organic heirloom seeds, and save your seeds each year after harvest. Tell the catalog seeds companies that you will only buy Organic seeds. Read the Book SEEDS OF DESTRUCTION by F William Engdahl (NOT to be confused with SEEDS OF DECEPTION). SEEDS OF DESTRUCTION tells the true purpose of GMOs and that is to control the food supply and to be able to deny food as a weapon against other countries. These people are evil to the core. Control the food and the water and you will control the people for a time, but then you will have a revolution that will be unstoppable, until all that are responsible are punished.